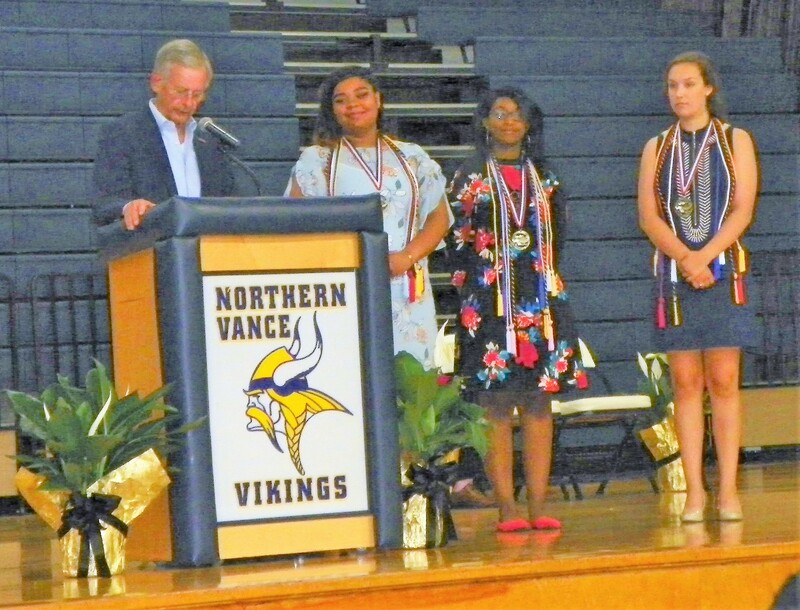 Members of the Class of 2018 at Northern Vance High School were honored during the evening of May 17, at their Class Night celebration held in the school’s gymnasium. Students in the 177-member class were recognized for their accomplishments during their high school careers. They also accepted scholarships to further their educations at colleges and universities beginning this fall. Their scholarships totaled almost $2 million. An audience of about 500 people attended Class Night to pay tribute to the graduates. Several senior leaders led the event. Laneka Littlejohn served as mistress of ceremony. Jadyn Jones, another senior, sang the “National Anthem.” Briana Coleman mad welcoming remarks and Makayla Jefferys read the “Class Poem” to her fellow graduates and the audience. La’Niayah Bates and Omar Closs introduced the class slide show and Kwaji Bullock and Nisia Superville led class shout outs and memories. Mark Lawhorne, an assistant principal at Northern Vance, provided closing remarks. Class of 2018 leaders stand on the stage as their fellow graduates walk in to begin their Class Night celebration at Northern Vance High School. Special recognition during the evening was given to graduates who are among the top 10 percent of the seniors in academic standing. They include: Akyvia Alston, La’Niayah Bates, Clara Bobbitt, Kwaji Bullock, Jordan Burnette, Briana Coleman, Diamond Durham, Jamon Glover, Destini Hargrove, Madison Hetrick, Makayla Jefferys, Jadyn Jones, Autumn Julian, Laneka Littlejohn, Erin McAllister, Manaya Perry, Shyanne Robertson, Christopher Stainback, Cody Stainback and Jonathan Vu. Image Information: Tommy Hester, representing the Golden Leaf Foundation, stands at the podium as he presents scholarships to Northern Vance seniors, from left, Makayla Jefferys, Briana Coleman and Clara Bobbitt.